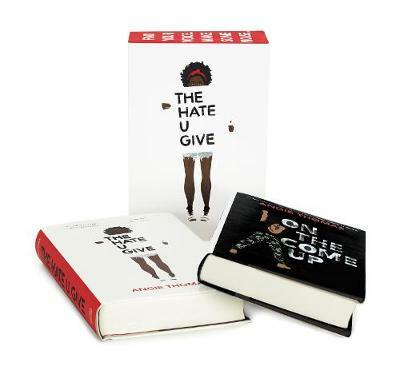 Discover the critically acclaimed, #1 New York Times bestselling The Hate U Give and the highly anticipated On the Come Up from Angie Thomas in this hardcover box set. FIND YOUR VOICE. MAKE SOME NOISE. The Hate U Give William C. Morris Award Winner National Book Award Longlist Mi... read full description below. Discover the critically acclaimed, #1 New York Times bestselling The Hate U Give and the highly anticipated On the Come Up from Angie Thomas in this hardcover box set. FIND YOUR VOICE. MAKE SOME NOISE. The Hate U Give William C. Morris Award Winner National Book Award Longlist Michael L. Printz Honor Book Coretta Scott King Author Honor Book Absolutely riveting! --Jason Reynolds Stunning. --John Green This story is necessary. This story is important. --Kirkus (starred review) Heartbreakingly topical. --Publishers Weekly (starred review) Sixteen-year-old Starr Carter moves between two worlds: the poor neighborhood where she lives and the fancy suburban prep school she attends. The uneasy balance between these worlds is shattered when Starr witnesses the fatal shooting of her childhood best friend Khalil at the hands of a police officer. On the Come Up Sixteen-year-old Bri wants to be one of the greatest rappers of all time. Or at least win her first battle. As the daughter of an underground hip hop legend who died right before he hit big, Bri's got massive shoes to fill. But it's hard to get your come up when you're labeled a hoodlum at school, and your fridge at home is empty after your mom loses her job. So Bri pours her anger and frustration into her first song, which goes viral...for all the wrong reasons.